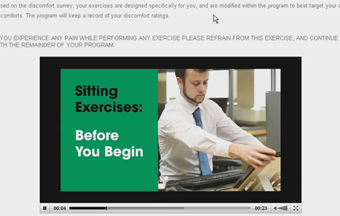 EHA required a set of video examples (to be available online in a web-based application) for a set of exercise programmes for computer-based workers based on discomfort areas which the workers identify (referred to as “ErgoX”), demonstrating how these should be implemented by workers. In addition, EHA required an additional set of video examples of stretching activities, which would also provide additional on-screen text and highlight muscles to be stretched mid-exercise, for factory-based workers with which would be available in a DVD presentation. For the ErgoX programme, DEIS developed a number of video pieces involving 2 individuals on-screen (one stretching and a second helping) with an additional audio voice-over added in post-production. These videos were then optimized for online viewing and integrated into a web-based application. For the ErgoY programme, DEIS developed a number of video pieces involving a single individual on-screen, with a number of effects added in post-production identifying where the user should feel pressure when performing the exercise. These videos were then optimized delivery via DVD. EHA is a specialist occupational health and hygiene practice providing tailored occupational health and industrial hygiene solutions to suit the needs of individual organisations. EHA’s client base and the calibre of their consultants provide a broad range of experience across many industries.